Happy New Year! Now that Listmas is over, and every photobook has appeared on some “best of” list, we can get back to dealing with them in a more meaningful way. I finished work on the book I was writing (at least for now), leaving me with a lot more time to attend to this site than I had all of last year. I’m looking forward to it. So without further ado, here are some reviews. A truly good photobook will offer you a unique experience. Ideally, it will do that to you effortlessly, drawing you into and immersing you in this world created with pictures that is contained within its covers. My favourite experiences are those that operate on multiple levels, but that make me feel something first, before having me think. To create such a book isn’t easy. You can’t try too hard, and you’ve got to keep your inner control freak in check. Instead, the pictures will have to do the lifting, guided and helped by the form of the book. There now exist quite a few photobooks that manage to create such a world of their own. Examples include Awoiska van der Molen‘s Sequester, Lorenzo Vitturi‘s Dalston Anatomy, or Cyril Costilhes‘ Grand Circle Diego. Note how each of these books was published by a smaller publisher. Might this tell us something? I’m not sure. For a start, it’s a small sample. But then, larger publishers tend to be more conservative, shying away from anything too far from their standard fare. So it might indeed be smaller publishers that are right now pushing the boundaries of photobook making. Not that I want to push this point too far, but Pierre Defaix‘s 2224 Kolkata, another book that falls into the small and exclusive category of books I was talking about, also does not come from a major publishing house. The book was published by Berlin based Peperoni Books, which is owned and operated by Hannes Wanderer (who also mysteriously finds time to maintain a great photobook shop in Berlin, 25books — make sure to visit next time you’re in the city). Much like Sequester, Dalston Anatomy, and Grand Circle Diego, 2224 Kolkata throws the viewer into its own world of pictures, photographs taken in Kolkata, India. By construction, photobooks appeal to more senses than merely the visual one. Beyond its immediate, literal experience — beyond the feel of the cover, of the pages, and the smell of its materials — the book conjures up the experience of being in the world depicted inside its covers. Its tightly cropped images bled to the pages’ edges, it has the viewer participate in an exploration of what can be found just in front of the camera’s lens. 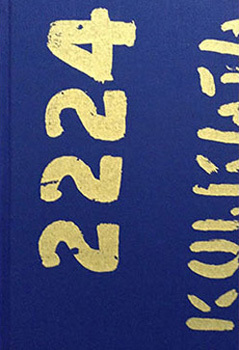 2224 Kolkata clearly is an outsider’s book, made by someone too dazzled to be able to comprehend. It does not make many efforts to do so, either. What is to be taken in is simply taken in, reducing the viewer almost to a childlike state. There is a sense of wonder, a sense of being bewildered. It’s a visceral book, and seeing examples of its spreads (or photographs) online doesn’t even remotely come close to seeing the book itself. I will admit I thirst for such books, coming out of a world — the world of photography — that has become so joyless, so cerebral, and, frankly, so boring lately. And it looks like it’s the small photobook publishers that are offering us a way out, giving these mostly not-very-well-known(-yet) photographers a chance. There is no single approach to looking at photobooks, though. 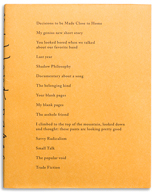 While 2224 Kolkata had me right away, I almost didn’t buy Michael Schmelling‘s My Blank Pages, putting it back after having leafed through it briefly. David Strettell made me look again, so I did, and that did the trick. Of course, there is really nothing wrong with cerebral books, provided they’re done well. They can, after all, create a world of their own just like the punchy ones, except their job is a little bit more difficult in a variety of ways. For a start, the pictures usually don’t do as much lifting, at least in an immediate sense. The world conjured up is not offered — the viewer will mostly have to create it on their own, channeling considerable amounts of their own inner space into it. That’s what My Blank Pages does so well. A collection of initially not necessarily terribly exciting photographs, these photographs are given more and more weight with each repeated viewing. There is text in the book, right next to the pictures, handwritten by the artist. And that is what does so much of the work here. Of course, it must be a tremendous pain in the neck to write the same text into hundreds of books. But that’s not why that text matters. It matters because the words get a completely different sense of immediacy, which you couldn’t get any other way. The text, the viewer/reader realizes, was written just for you (and, mind you, hundreds of other strangers, but that’s besides the point). Someone is very clearly communicating with you, right there, right then. I’m hoping this book is not going to spawn hundreds of copyists — much like Redheaded Peckerwood had everybody and their grandmother add all kinds of material to their books. But even if it did, the copyists are not going to succeed so easily. My Blank Pages is a book about photography, about being a photographer, about being visually clever, about all that kind of stuff. It sounds boring, and while being a photographer etc. probably is (much like that being a writer is, or an astrophysicist), the book is profoundly engrossing. It’s the kind of situation where a lot of clever stuff ends up as something that is clever, but that also is a lot more than that. I’m tempted to think — and I realize that the following is a bad cliche (so buckle up!) — that this book essentially is about life, about how frickin’ mundane and seemingly pointless everything is. But we go about it anyway. And we make the best of it, collecting our scraps and pictures and receipts and personal memorabilia and useless junk here and there, with all that stuff becoming a manifestation of said life, kinda sadly. We wouldn’t want it any other way (not that we could).